A leading travel industry forecast finds U.S.-originated business travel grew nearly 3 percent year-over-year, with company spending for business travelers increasing 7.6 percent to $71.2 billion during the first quarter of 2014. This indicates rising management confidence in the economic recovery, which tends to accompany increased travel budgets and fewer travel restrictions. 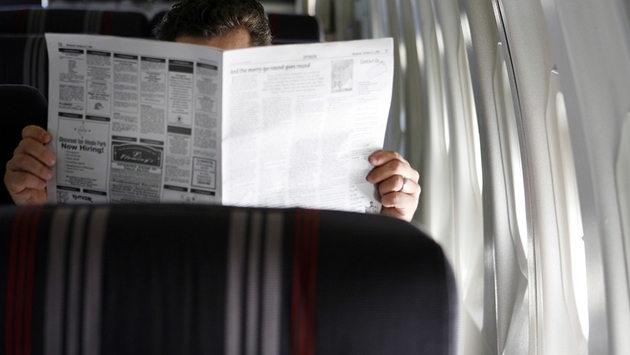 Overall, U.S.-generated business travel spending is expected to increase 6.8 percent to $292.3 billion in 2014. 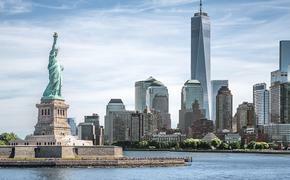 The Global Business Travel Association (GBTA) reaffirmed its positive forecast of the U.S. business travel industry with the release of the GBTA BTI Outlook – United States 2014 Q2, sponsored by Visa, Inc. The report highlights the important relationship of business travel to overall U.S. economic growth. The total number of domestic person business trips in 2013 was revised upward to 468.8 million from the previously reported 448.7 million, resulting in a 4.7 percent year-to-year gain. Spending remained consistent with the previous forecast at $241 billion, indicating a lower-than-estimated spend per trip. Group business travel significantly outperformed individual business travel in 2013, growing 8.6 percent, a significant indicator that the business travel industry is recovering from the recession and increasing discretionary spending. While individual business travel volume is only expected to grow 2.3 percent in 2014, spending is expected to increase 5.6 percent, driven by higher prices and additional spend-per-trip. In addition, the study identified other key trends that could impact business travel in the coming months, including the price of oil, cost of travel and international outbound business travel. Oil prices have a direct impact on business travel, causing the price of jet fuel and other travel related expenses to fluctuate. Oil prices also provide future insight into both economic growth and travel inflation. Currently, oil supply is tracking well above demand, suggesting favorable oil prices on the horizon. Geopolitical upheaval – particularly in the Middle East – is always a risk, causing oil spikes and almost immediate downstream increases in airfare and other travel prices. 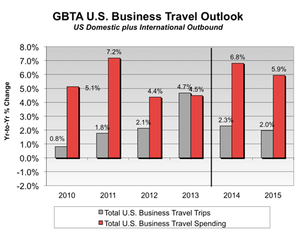 GBTA expects travel price growth to remain relatively low at 1.9 percent, before picking up pace in 2015. The low estimate is in large part due to the relatively stable airfare prices, but prices are likely to rise as consolidation in the industry puts more pricing power in the hands of the airlines. Rising food prices, rental car rates and lodging are currently the largest contributors to travel price growth. International outbound business travel continues to rise, with trip volume expected to grow 6.6 percent and trip spending increasing 10.3 percent in 2014. This data indicates that the global economic recovery is underway. Although things appear to be on the upswing, GBTA continues to be cautious. Lower-than-expected inflation poses risks for advanced economies, there is increased financial volatility in emerging market economies and increases in the cost of capital will likely dampen investment and weigh on growth. 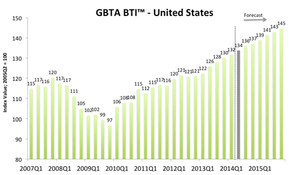 The GBTA BTI™, a proprietary index of business travel activity, is now estimated to reach 134 in Q2 2014, bolstered by a strengthening domestic economy, an improving external environment and slightly higher travel prices. This represents a two-point gain over the previous quarter and an eight-point year-to-year gain.